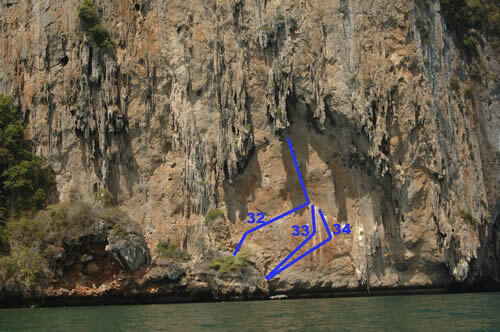 The Climbing here was pioneered by Trevor, the man who gave us the Keep, one of my favorite climbing spots in Thailand. The climbs here are an interesting mixture of roofs and some facy technical stuff. All in all very good. Thanks to Trevor, Steve, and others! This is the first wall you come to walking down the beach, the closest wall to the tents. Start from anchor on left side of ledge. Start from anchor on the middle of ledge. On the right side of the first tufa. 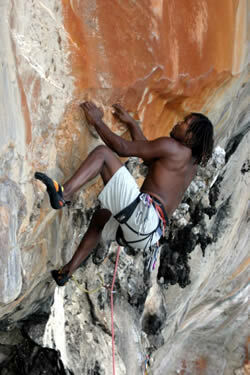 Follows lip to the right and then up and around hanging tufa to the arete. Backclean the first few draws to reduce rope drag. Shares the start with Lip Service. Can be lead in one pitch. Can rappel to middle anchor, then to ground with one 60 meter rope. Shares the start and anchor with 50 Dollar Meat Wallet. Backclean first two draws. Most popular multipitch. Climb up the left ladder and move right. Fist anchor hanging belay, you could climb past it and belay from the large ledge of the second pitch. 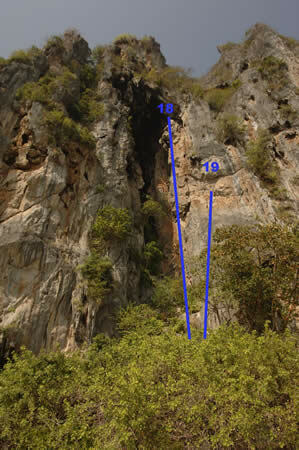 Third pitch is 33 meters long. 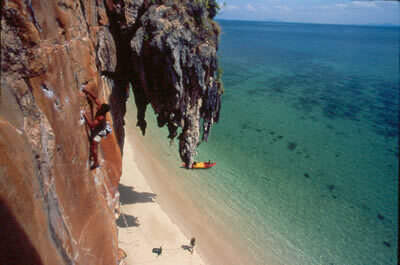 From the top of the third pitch you can rappel to the beach, with two 60 meter ropes. 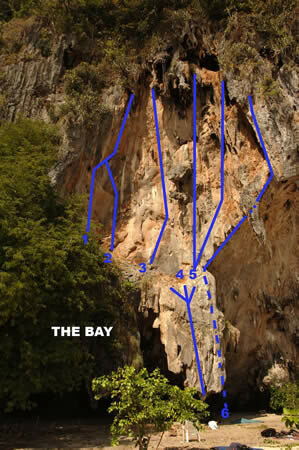 The 4th pitch is solo through the slot in the ceiling of the cave. Ends up on top of the island in the most amazing jungle. Get dropped off by a kayak. 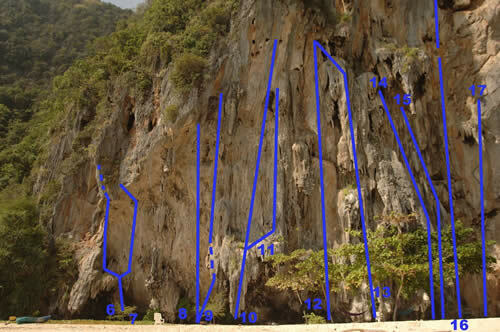 Two fixed lines up to belay ledge. Solo up on left rope. 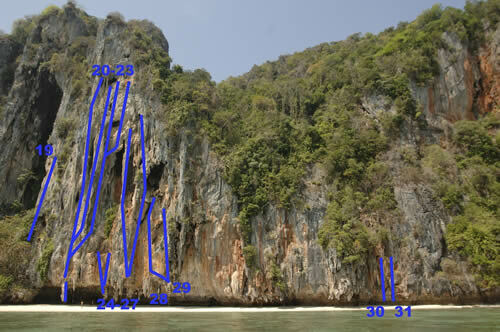 The most exposed sea cliff climbing in Thailand on a fantastic wall. You can rappel the right rope to the beginning of the climb. Alternative link up to Wild Side.